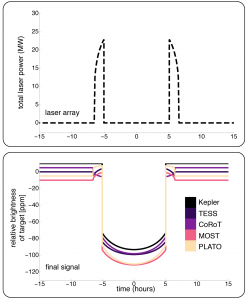 Following the theme of last week’s papers which took a look at alternatives to radio searches, this week’s papers focus on laser SETI in the optical and near-infrared. The first paper to discuss this possibility was Schwarz & Townes 1961, which was published just two years after Cocconi & Morrison motivated the radio SETI search in 1959. In an act of sheer clairvoyance (probably afforded by the fact that Townes won the Nobel prize for the discovery of lasers), the authors predicted a time when “maser apparati near the optical” technology would exist and be a viable alternative method of interstellar communication. Notably, in our timeline, the discovery of lasers followed the development of radio communications; however, it seems that there is no necessary reason why this ought to be the case. One could imagine an ETI developing proficiency with lasers first, and hence use those as the primary means to signal to other ETI. Therefore, the abilty to detect a optical beams is an important addition in the ensemble of SETI search avenues. To detect such a beam, the authors set two criteria: 1) that it produces enough photons per unit of area on the r eceiving end to be detectable (given the design of the detector and telescope), and 2) that it is distinguishable from the background. Given those criteria, they examined the possibility of whether or not an optical beam can be used to establish interstellar communications by testing two systems: 1) one which consists of a continuous 10kW beam at 5000A with a bandwith of 1Mhz and assuming a 200in reflector telescope, and 2) an array of 25 lasers like in part (1), but with an effective aperture of 4in. They conclude that in both cases that a signal carried on such a beam ought to be detectable to a distance 10ly given c. Earth 1960 technology. Of course, the technology of today is significantly more advanced than sixty years ago, so probably this estimate is highly underrated. This paper is important because it was one of the first to offer a novel approach to the SETI problem (I believe the second after the Dyson 1960 paper). This paper’s predictions were vindicated by papers such as the other one for this week (Wright 2014) and others which actually conducted optical and NIR SETI searches. This paper laid the groundwork on which these subsequent additions build and helped frame our thinking about how a laser search ought to be conducted. Indeed, as we move further into the 21st century (only the second century of electronic technology on Earth) we are fastly transitioning to fiberoptical communication. Could it be that other societies also inevitably reach this conclusion as well (or at least transition through such a phase on a path of development to some even more advanced communication scheme)? Only a dedicated laser SETI search can attempt to answer those questions! Continuing with the theme of optical SETI from last week, this week’s Howard et al (2004) paper discussed the results of an optical SETI experiment which searched for pulsed beacons around thousands of stars. Following with the other optical SETI papers we have encountered, the authors compare the merits of searches in the optical/NIR with searches for microwave/radio signals. If one’s figure of merit for the efficiency of technique is the signal-to-noise achieved for a fixed transmitter power, then optical methods are comparable to those of radio. They further motivated this search by presenting the “Fundamental Theorem of Optical SETI”, which is a statement of the observation that even at our early stage of technology (Earth “2000”), we can already generate artificial optical pulses could appear to outshine the brightness of the Sun by a factor of 10^4. This follows a similar line of reasoning as the Schwarz & Townes paper from last time, which plausibly suggested that some ETIs would rapidly discover some form of optical interstellar communication and use it. However, in the case of Howard’s paper, the focus is on the search for pulsed beacons, which are unambiguous detections of alien laser signals (for which there are no possible astrophysical confounders or dopplegangers). With similar avalanche photometer instruments at Harvard and Princeton, they began their campaign which would eventually consist of some 16,000 observations totalling 2400 hours of observing time spread over a five year baseline. They searched 6176 stars in their survey, of which only a handful of signals showed any promise as plausible artificial pulses (most were explained away as being stochastic in nature). Three triggers from HD 220077 were considered the most interesting, and were allotted many follow-up observations. Upon further investigation of those candidates, they found that their photon rate was consisten with Poisson noise and thus rule out the alien hypothesis. (Remember, it’s never aliens!) Another interesting pair of triggers from HIP 107395 was considered too ambiguous because of an asynchronicity between the Princeton and Harvard clocks. This work was performed in fulfillment of Howard’s PhD thesis in astronomy; Andrew Howard is now a prominent exoplanetologist and astronomer, and so this work is a demonstration of SETI being firmly rooted as a part of astronomy and an example of the quality that SETI papers ought to strive for (that is, when it is taken seriously by astronomers and other scientists). It is also a good example of “Forensic” SETI done right, where the candidates were scrutinized on a case-by-case basis and all natural explanations were attempted to be exhausted before jumping to unsubstantiated conclusions (which contrasts with the approach of some other papers we have read this semester *cough* faces on Mars *cough*). Although the results were null, the study still placed valuable upper limits on the occurrence of beacons around nearby stars. Therefore, this paper serves as a template for how null results ought to be reported and makes a case for them to be published. The theme between the Townes (1983) and Hippke & Forgan (2017) papers is that our SETI efforts should not be solely focused on searches in microwave and radio frequencies. These papers make the case that there are in fact equally viable if not superior alternatives to radio in both the infrared (IR) and X-ray portions of the electromagnetic spectrum, respectively. SETI experiments have been influenced by the precedent set by the earliest ideas in the field, which emphasized the radio search (and often near the 1.2-1.67GHz water hole). In fact, it was Cocconi and Morrison who gave us the idea that the most important factor when imagining interstellar communication systems is their efficiency in terms of photons per watt, which led them to pursue the radio search. However, with the development of new technologies and perspectives, it is clear that this narrow viewpoint misses out on a greater variety of possibilities. These are examples of quality SETI papers because they attempt to expand our perspective and push boundaries. They remind us that we should be ever aware of falling into narrow-minded modes of thinking, and that when dealing with the perplexity of trying to predict the motivations and strategies of an ETI, we should stoically expect that we are wrong. They are also remarkable in their approach to the question. In the case of Townes, he thinks critically about the observational challenges of moving to the infrared and quantitatively compares the pros and cons of IR methods with those of microwave/radio. He is also cognizant of the fact that there are a lot of assumptions (which he makes explicit) made about the strategy of a transmitting ETI which we can only speculate about and limit the effectiveness of the IR search. On the other hand, Hippke & Forgan are motivated by the search of the global optimum for interstellar communication, which they decide ought to be in the X-ray near 1nm. In pursuit of this grail frequency, they examine a variety of astrophysical and observational difficulties which complicate communication, such as diffractive photon loss, interstellar extinction, and atmospheric transmission. In this way, both papers are firmly rooted in taking a classically quantitative and astronomical approach to SETI. This places these papers a tier higher than those which solely offer speculation on search strategies unsubstantiated by rigorous examinations of the merits of the alternative. Overall, the field benefits when scientists take SETI seriously and improve it by contributing to it with quality papers. My opinion of this paper is completely biased by the fact that I’ve actually met David Kipping and that I read this paper back when it first went on the arxiv. This was my first exposure to SETI (beyond science fiction, if that counts) and I think it went well! Kipping and Teachey postulate that a civilization (even the Earth) could use lasers in some interesting ways. They first suggest that a planet’s transit could be clocked, monochromatically, against a Kepler-like survey, without the need for much power (~30MW). Due to the Earth’s rotation, this would require multiple laser stations, but in the end, it would be doable. They then continue on to talk about clocking the signal at all wavelengths. This would be a bit more challenging, since many lasers at many different lasers would be required, and again these lasers would need to be placed around the planet, and the power requirement would increase by an order of magnitude, but a committed civilization could manage it. Both of these cloaking processes can be argued against since the planet would still be detectable via other detection methods (namely RV). The last bit of cloaking they suggest involves the cloaking of biosignatures. A disequilibrium in an atmosphere (normally of oxygen) is a decent indication of life on a planet. These and other related absorption features are referred to as biosignatures. If lasers were emitted at these absorption features, then the planet would still be detected and noticed, but it would just not be studied much since it would be presumed uninhabitable. This is all, of course, under the assumption that other life out there is Earth-like, and that this Earth-like life would be looking for signatures similar to their life (Earth-like). Because of this Earth-like assumption, it is possibly that another civilization is already doing this for *their* biosignatures, we just don’t notice it though because we are looking for our biosignatures (also clouds are apparently all that we can see right now). Lastly, the authors bring up the point that this laser method can be used not just to cloak, but also to signal existence. They briefly mention that the easiest way to get someone’s attention with this would be to cloak the transit’s ingress and egress, making the transit appear boxy and all around wrong. Although this is a neat idea, it seems a little far fetched and specific to me. Sure, we have tons of data, so someone might as well look through for boxy transits (I think someone has already done this with Kepler data), but this seems so absurdly unlikely to happen. However, my thoughts on the likelihood of this completely come from the way I view humanity and our goals and motivations, so it’s just as possible that my thoughts of this being a waste are a minority in the galaxy. I feel that it is quite appropriate for me to review this paper by David Kipping two days after we conducted an observation of 12 transiting Kepler planets from Green Bank Telescope in association with Breakthrough Listen, based on the principle outlined in this paper. The paper talks about using lasers to cloak the presence of a planet during its transit. However, in this blog I shall not talk about a civilization trying to mask its presence but its attempts to broadcast itself. The paper proposes the principle of a temporal Schelling point in our search for ETI. The question often arises of the best time to search. Since there is no real special time, this paper suggests that the transit of an exoplanet around its host star could be one. If there is a beacon on the night side of the planet, then it would sweep out an arc as the planet revolves around its star. This beacon would be visible from our line of sight when the planet transits the star, if it is directly aimed at its sub – stellar point. This beacon if broadcast continuously would be visible to observers periodically with every transit. Doing this during a transit is an interesting proposition since transits allow for us to also measure the atmospheric composition of planets using spectroscopy. Further, in the near future we should be able to map the longitudinal heat profile as well as atmospheric composition of planets using phase curve spectroscopy. This would provide for definite clues of bio-signatures. However, the beacon might not necessarily be on a planet which is inhabited by the ETI. The beacon can be on the closest planet, since that would have the highest probability for transiting in a randomly oriented system. I think this paper is important in acknowledging the special place transits occupy in the optical astronomy, and subsequently extending it to SETI. Its ideas about a civilization using this phenomenon to hide its presence or beam out and advertise itself are novel, and can be one of the anomalies being considered in Wright et al. 2015 (GHat 4). Everyone has been in a situation where they need to make themselves conspicuous. Proponents of SETI have often provided novel solutions to ensure an observer would readily identify their planet as one hosting life. The answer can be condensed to a basic principle: do something unnatural at the exact moment someone is observing you. David Kipping, an astronomer at Columbia University, who searches for planets and moons beyond our solar system, believes lasers can be used by ETI to serve as a beacon or mask a planet entirely. In a recent paper, Kipping and a graduate student argue that artificial transit profiles can be feasibly generated using laser emission. Unlike optical SETI, which focuses on pulses of light, Kipping believes the transit can be a useful signal to or cloak from Earth (see Movie 1). One of the co-authors of this paper sets out to describe how lasers could be used to cloak a transit. The timing of this video showed poor foresight (April Fool’s Day….). A secondary video by Alex provides answers to some common questions from YouTubers. The use of transits in SETI goes back to the pre-Kepler days, when Luc Arnold first proposed distinguishing a transiting mega-structure from a natural body. Cloaking a planet requires many assumptions. Kipping ask us to consider an arbitrarily advanced civilization that discover all “nearby” habitable planets along their ecliptic plane. Kipping assumes the inhabitants would know which of these planets could observe their transits and, through some machinations privy only to ETI, such civilization would decide to prevent detection by these planets using the transit method. Kipping et. al. dismiss a previous suggestion of a mega-structure, arguing a powerful laser would be “technologically more feasible”. After performing a few calculations, Kipping et. al. 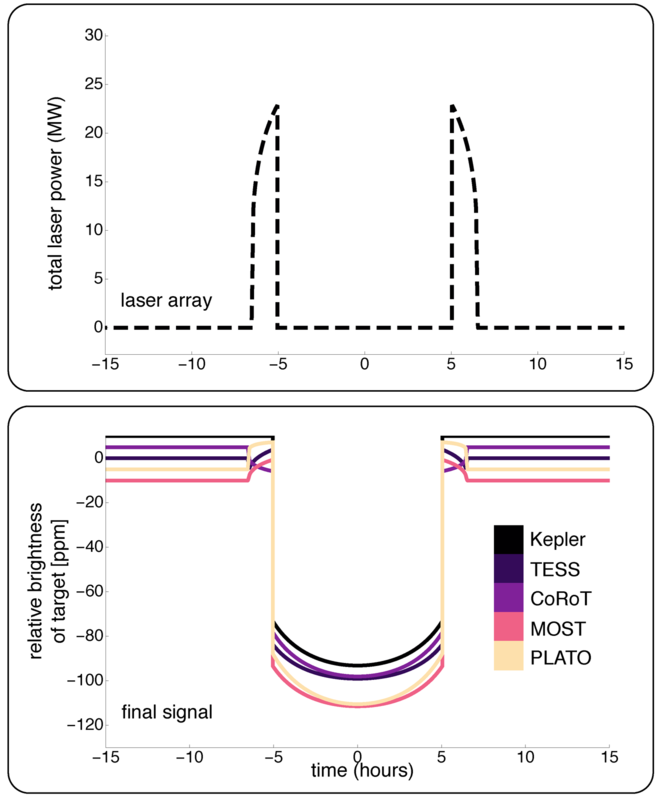 argue a ~60 MW laser would serve as an optical, “broad-band” cloak and prevent detection from a mission such as Kepler. A laser, while monochromatic, could in theory serve to effectively mask a transit, as shown in Figure 1. Kipping et. al. argue that a laser array on the surface of a planet would be difficult and that instead ETI could place an array of lasers in space (colloquially known as a weapon). The authors aptly refuse to compare either solution. A similar and energetically cheaper alternative would be to use lasers to block out the absorption lines of biosignatures. Both images are from Kipping et. al. 2016. On the left: Cloaking of a Transit Signal. The top panel shows the unaltered transit for various missions. The middle panel is the power profile of a 600 nm laser array designed to cloak the Earth. The bottom panel shows what an observer would detect. On the right: Using Transits as a Beacon. The top panel shows the power profile of a laser array designed to broadcast the Earth. The bottom panel shows the transit signature an observer would detect. The laser makes for very unnatural signatures that distinguish it from orbiting planets. You can make your transit look strange, have bumps and wiggles, maybe even the New York City skyline—whatever you want. Savvy extraterrestrial scientists could use a deformed transit as a beacon to announce their existence (see Figure 2). By Kipping’s hypothesis, ETI no longer required planet-size megastructures, such as a rotating triangle or louvres, to produce unnatural transit signatures. Transits are not the only method to discover planets and thus a truly xenophobic civilization may conclude that even a perfect and chromatic transit cloak would be ultimately defeated by observation of the planet using radial velocities. In this sense, the biocloak is perhaps the most effective strategy since certainly the transit and radial velocity measurements would appear compatible. However, even here, direct imaging would reveal a strong discrepancy in terms of the atmospheric interpretation and thus overcome the cloak. A large part of this paper was to discuss how a transit could be cloaked, only to have that entire hypothesis appear to be an act in vain. The discussion on broadcasting with a strange transit signature is not fundamentally new. This blogger is left pondering the purpose of this paper. The authors themselves have dismissed the efficacy of cloaking and suggest we search for strange transits, something proposed by Arnold a decade earlier. Even if one were to assume cloaking to be efficient, SETI has predominantly concerned itself with civilizations indifferent to outside observers. After all, one could always invoke any arbitrary set of conditions or technology that would make a civilization impossible to detect. 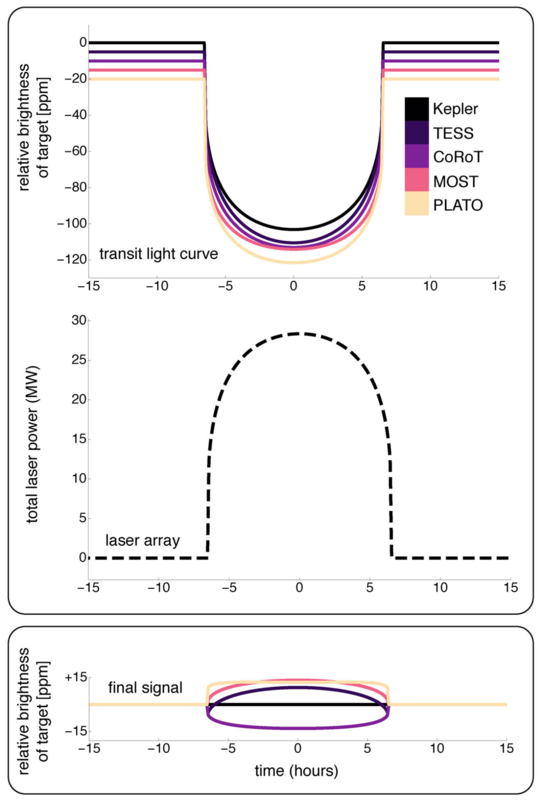 While the method of using lasers is novel, the rest of the paper reminds astronomers to search for strange transit signatures. Believe this requires strong priors and an indifference to all the assumptions. Kipping himself expects detections “on the order of a few dozen” and this blogger wishes him the best in his future endeavors. Reaction to Hippke 2017 (Non-EM Carriers): Is the SETI search too narrow-minded? Since the conception of communications with extraterrestrial civilizations in the late fifties (Cocconi & Morrison 1959), the overwhelming majority of SETI endeavors have centered on electromagnetic communication systems, often in one narrow fraction of the entire spectrum. Hippke is aware of the potential shortcomings of such an approach and presents the possibility of alternatives, not just to microwave emission as in his previous work (Hippke 2017), but to electromagnetism as a medium for information carrying in general. In particular, he examines the merits and shortcomings of a variety of non-EM carriers such as electrons, protons, neutrinos, gravity waves, and occulting megastructures. Vetting based on energy efficiency and data rates, Hippke places these alternative channels in competition with EM-based communications. For transiting megastructures, Hippke fails to find a way for this method to be competitive when it comes to target communication with high data rates, and so tepidly dismisses them. He also quickly rules out charged particles, particles with short lifetimes, and heavy particles due to interstellar magnetism, longevity, and energy requirements, respectively. He is also critical of gravitational waves as a medium for signal carrying as their artificial production is extremely resource intensive and wasteful. Lastly he examines neutrino based communication, which fails due to issues with focusing when compared to photons and size requirements of detectors. All of his conclusions are based on current knowledge of physics, and so the possibility is open that with an improvement in knowledge, some of these avenues may potentially become viable again. He has framed this investigation to work within the confines of what is currently understood. With these limitations, he concludes that the best medium for point-to-point communications is still electromagnetic radiation, at around the 1nm scale. If the assumption of preference for speed is relaxed, then the best alternative would be inscribed matter, or probes carrying vast databases of information. This paper was a novel contribution to SETI because it is one of the first attempts at an exhaustive analysis of alternative modes of communication. Scientists can often times get caught up in the present paradigm, and so it is beneficial to get a fresh perspective on the issue from someone who is not formally scientifically trained and thus potentially not subject to the same prior perceptions. His conclusions also vindicate the thinking behind the Pioneer and Voyager plaques and records, since physical media transported on long timescales is shown to be one of the preferred methods of communication. The potential this paper had to to retroactively dismiss all of our previous SETI efforts as foolishly narrow-minded or misguided should not be discounted. While we will continue to perform SETI in the radio and microwave, we should always be open to the possibility of alternative means of communication, and at the very least entertain a more expanded search of the electromagnetic spectrum when designing future SETI surveys. This 1961 paper by R.N. Schwartz and Charles Townes, discusses using Optical Masers (Lasers) for communication across interstellar distances. I feel that it is worth noting that this falls closely on the Cocconi and Morrison paper of 1959 which first suggested the water-hole in the radio as the ideal place to look for, for intelligent extra terrestrial (ETI) civilization. The authors talk about the recent discovery of ruby optical Masers by Townes. Since the M in Masers is for Microwave, optical Masers, were soon called Lasers or Light Amplification by Simulated Emission of Radiation. The authors consider using Optical Masers (Lasers) on two different systems and compare the two. One is a laser on a 200 inch telescope (like the 200 inch Hale Telescope), whereas the other is 25 individual 4 inch telescopes with Lasers pointed in the same direction. They consider atmospheric seeing as a limiting factor and hence consider that the 25 individual small telescopes might be a better option. I think this paper was really advanced for its time, since 4 years after the launch of Sputnik (1957) it considers the use of Adaptive optics and space telescopes. It also considers the detectability of Lasers using 1961 technology levels for laser power and detectability. The paper also talks about high resolution spectrometers which could spectrally resolve the laser and hence detect that this artificial beacon outshines the host star. This would be a hallmark of its artificial origins. The paper concludes by noting that the water hole in the radio should not be the only region where we look for interstellar communication. It also mentions that an advanced ETI might develop capabilities that we have ruled out and consider impractical. Optical SETI is not exactly a novel approach, but one that has not yet been pursued in earnest. There have been recent efforts by Andrew Howard, Shelley Wright, Nathaniel Tellis in this direction. We must take advantage of the vast resources that are plowed by the astronomical community in this direction and utilize the instruments, development and data sets that exist as a product of this. Cocconi and Morrison initially proposed interstellar communication using radio waves, particularly near the hyperfine transition of hydrogen. The first SETI observations, conducted by Frank Drake, followed this suggestion of where to look. The focus in the microwave was a result of technological limitations, as observations at other frequencies were unimaginable when Cocconi and Morrison initially presented their work. With the discover of the maser in the 1950s, a new vector for communication became available. 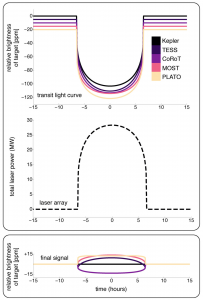 The authors postulated that “maser oscillators and other appropriate apparatus in or near the optical region [will] allow detectable light signals to be beamed between planets of two stars separated by a number of light years”. The creation of the laser in 1960, a more practical device than a maser, served as further justification for this claim. it must be distinguishable from the background stellar light. They argued that the intensity of radiation from the group of masers would produce a beam of high intensity capable of being observed by the naked eye or binoculars out to 0.1 or 0.4 light years, respectively. A larger telescope of long integration would be required for masers further than 10 light years. The authors note that, from the work of Cocconi and Morrison, there were ten Sun-like stars within a distance of 10 light years, making masers very applicable to SETI. Spectra would be another useful diagnostic for a maser. A grating spectrograph in the 1960s could have resolved the energetic maser as a signal equal to the stellar background. Noting this, Townes and Schwartz propose that “[a] spectral line sought can be expected to be exceptionally narrow, at an abnormal frequency for the type of star in question, and varying in intensity [o]bservation of any of these characteristics should lead to closer examination” of an object. In less than a decade after discovery, masers were already being considered for SETI. The advantages include the coherence of radiation over a very large aperture and the theoretical possibility of obtaining coherence among several maser sources. Given that nay plausible atmosphere would prevent emission of masers, the authors propose utilizing a “very high-altitude balloon, a space platform, or natural Moon”. Only two years passed after Cocconi and Morrison published and people began considering where to look. This is an on-going discussion, but the authors correctly argue that charged particles would be deflected while UV and IR emission would be absorbed by an atmosphere. This blogger considers this to be an important discussion. When this was originally published, SETI was still in its infancy and the authors emphasized the need to consider other wavelengths before all of SETI focused on microwaves. While the development of masers may have stymied after the discovery of the more practical laser, optical SETI now exists. Recent progress in masers (see Movie 1) suggest their applicability will soon increase. Perhaps the masers of the future will become useful for SETI as Schwartz and Townes initially proposed. Laser are everywhere, but masers came first! They are like lasers but in the microwave. This video shows the latest applicability of masers. Who knows, perhaps the suggestion by Schwartz and Townes to use masers for communication is not too far off. We propose to examine the possibility of broadcasting an optical beam from a planet associated with a star some few or some tens of light-years away at sufficient power-levels to establish communications with the Earth. There is some chance that such broadcasts from another society approximately as advanced as we are could be adequately detected by present telescopes and spectrographs, and appropriate techniques now available for detection will be discussed. Communication between planets within our own stellar system by beams from optical masers appears a fortiori quite practical. They concluded “the frequency of the hydrogen line in the micro-wave region is not the only reasonable place at which to search for possible interstellar communications, and […] the optical region also seems a logical one”. This paper can largely be viewed as a continuation of his initial work. if needed, the use of space for the beacons is to be expected. Townes consider numerical evaluations of the signal-to-noise ratio (SNR) for different wavelengths. One potential observation scheme involves using longer wavelengths with linear detection of all wavelengths and a constant antenna area but solid angles corresponding to the diffraction limit only for wavelengths >1 cm. The other observation scheme involves short wavelengths with a quantum counting detector and an antenna with a fixed diameter for long wavelengths down to 1 cm and then decreasing linearly in size to 10 m in the infrared. These were but two examples discussed. Townes concludes that, depending on the assumptions, other regions, such as the infrared, should be considered. This was a marked departure from what was initially proposed by Cocconi and Morrison. While Townes initial suggest of using the infrared may not be used today, the discussion regarding where to look is still ongoing. Experiments in optical SETI have since been conducted (e.g. Reines & March, 2002), Laser SETI is a thing (see Movie 1), and it optical SETI is one of the projects of the SETI Institute. Recent papers have scrutinized both the wavelength of photons and even the nature of the particle observed by SETI. It may have taken over forty years since the first publication from Townes discussing masers, but at least proponents of SETI are no longer latching onto the microwave. Laser SETI is an example of the types of searches Townes proposed – something not tied to the microwave region. The optimal wavelength to observe is an important discussion that is still ongoing.